It’s been a busy year so far here at the DIY Doctor headquarters in rural Somerset, with plenty of exciting things going on. As we are now rapidly moving out of summer and into autumn, we thought it would be a good time to tell you all about the upcoming trade shows we are appearing at in the coming weeks. As we progress in to the second half of yet another year and the nights start to creep in, now’s the time to start thinking about all of those jobs to do for next year. Instead of waiting until spring, why not start planning now so that you’ll be fully ready to go as soon as the weather picks up and what better way to get some inspiration is there than visiting us at some shows geared fully towards this! If you receive our monthly newsletters or are a seasoned DIY Doctor user then you should be well aware that we attend numerous trade shows throughout the year running the Tricks of the Trade theatre, the main ones being the Homebuilding and Renovating Shows held in locations across the county. This years ExCel London show (21st – 23rd September at the ExCel in London) is going to take a slightly different format to the usual, in that our founder and head honcho builder Mike Edwards will be presenting on the new Checkatrade Trade Secrets Stage. If you live in London or fancy popping down to town for the weekend, why not call in and catch one or more of these shows and get some inspiration for some autumn/winter projects. Find out more about this years London Homebuilding and Renovating Show on their website here. This is a brand new event for us this year!! We have worked closely with the National Self Build & Renovation Centre team on and off over quite a few years now and this year we are proud to say we are taking the Tricks of the Trade Theatre along. 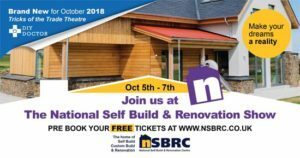 With this in mind, on the 5th – 7th of October 2018, we are happy to say you will find us at the National Self Build & Renovation Show in Swindon. Aside from the fantastic shows we have planned for you, by visiting the show you will also be able to tour around the entire renovation centre itself. If you are planning any type of building project, weather it’s a small shed in the garden or a full dream self build home, then the National Self Build & Renovation Centre is the place for you! With over 240 permanent exhibitors on display in the trade area, an independent team of experts ready to answer all of your questions, advice on financial planning, courses covering project management and renovation and workshops covering eco building, design and build and passivhaus, you’ll be sure to find everything you will need. For more information on this fabulous place and also to book your free tickets, visit their website here.